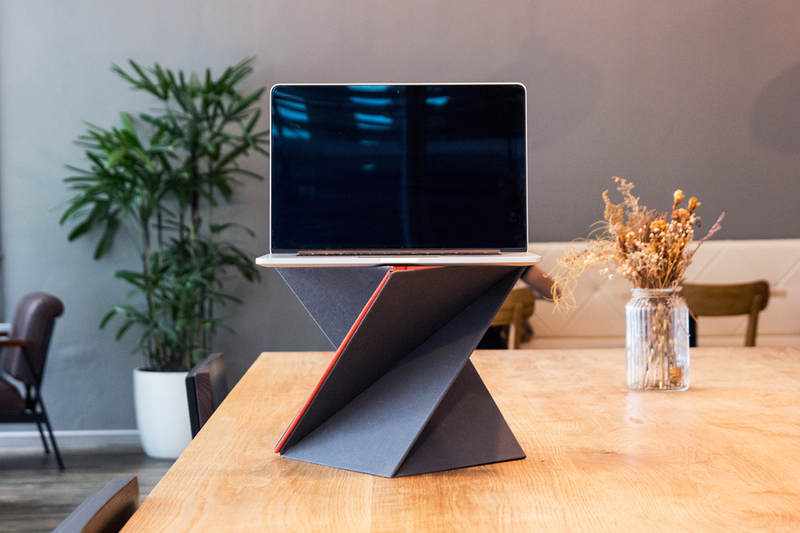 Meet LEVIT8, a flat-folding portable standing desk. Recently launched on Kickstarter, this innovative product gives you the flexibility to transform an ordinary desk into a sit-stand desk. The affordable LEVIT8 requires zero parts or assembly and twists upwards from a flat shape into a stylish 3D form. The project has already exceeded 100% of its funding goal in less than two days, but it’s not too late to get a LEVIT8 of your own—head over to the Kickstarter for an early-bird purchase. Recently launched on Kickstarter, this innovative product gives you the flexibility to transform an ordinary desk into a sit-stand desk.
. The affordable LEVIT8 requires zero parts or assembly and twists upwards from a flat shape into a stylish 3D form. The LEVIT8 is very lightweight.